Last week I caught up with the latest crime fiction from Carol O'Connell, who lives in New York City and sets her Mallory novels there, and Julia Keller, a Chicago-oriented writer whose journalism career earned her a Pulitzer there and whose novels of Belfa "Bell" Elkins focus on small-town and rural life in West Virginia. The differences are huge; the similarity that matters to me is, I trust each of these authors to take me into a crime novel where I care passionately about the protagonist and her allies. 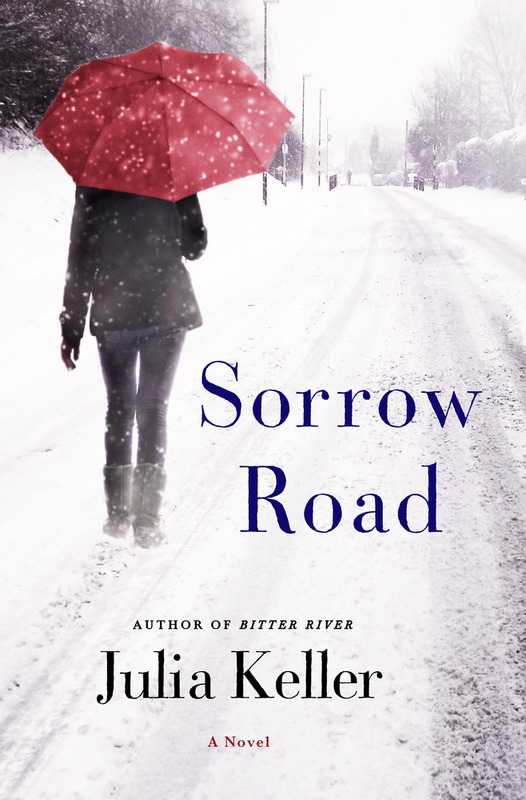 SORROW ROAD is Keller's fifth tale of Bell Elkins, the prosecuting attorney in Acker's Gap, West Virgina. The book opens with a tip of the hat to the issue that has nearly destroyed Bell's life in the preceding books: substance abuse, especially of prescription medication, and what horrible things people do to others and themselves to feed the habit or gain the incredible profits involved. Bell's marriage is long gone; her sister, now out of jail, doesn't even phone her in this season; and most painfully of all, her grown daughter chose to leave her and live in Washington, DC, while at the same time Bell's forced a gap into her relationship with the younger man who's become important to her ability to love herself. But of course, things are tougher than that -- questionable deaths at a nursing home in the next county become Bell's moral burden when a long-time woman friend of hers dies in the midst of probing the deaths. And Bell's daughter, caught up in a wicked case of PTSD with flashbacks, is in trouble. And, to make everything harder, the region's being pounded by high-snow-total storms. Really good crime fiction has at least a double mystery to it -- the kind that means sorting out the crime in order to bring justice, and the deeper one that bonds readers to characters, the risky business of trying to be both strong and sane in a world that often punishes people -- especially women -- who embrace that road. Keller's West Virginia novels take Bell fiercely into that double firefight. Well worth reading ... and very satisfying. 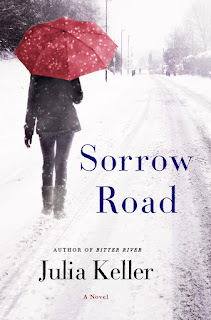 If you can make time for it, start with the first in the series, A Killing in the Hills, because the force of one book on top of the next will enrich SORROW ROAD when you get to it. If you're going into this newest title cold, though, you'll still get a very good read; you just may wonder why the rest of us like Bell enough to let her pull some of what she's up to in this one. 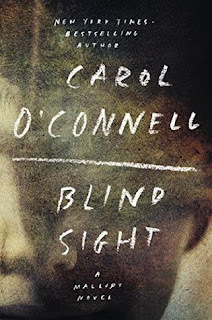 Carol O'Connell is one of the rare series novelists who doesn't promise a book per year -- her Mallory series comes with enough pain that I can picture the author insisting on her own timeline, to make room for recovery between drafts. Kathy Mallory was an abandoned street child/pickpocket adopted by a Manhattan police detective and his warm-hearted wife; BLIND SIGHT steps into a powerful season in her life, when her own police detective career is thriving (also very hard on her superiors) and her allies see her clearly. What they see, and what readers can access, is a brilliant detective who is driven, meticulous, wickedly humorous in her own dry way, and who refuses to socialize in normal ways -- in fact, probably she really can't. Her personality works well for the determined pursuit of a twisted criminal here, as both a blind boy and a nun in a monastic order vanish from the city streets on the same day, and turn out to be related to each other. It's up to Mallory to figure out whether there's a kidnap-and-ransom aspect involved, who's being forced to pay, and how ... while also racing the close in an effort to force the detectives around her to grapple with the investigation her way. Years ago, I tagged Mallory as a fictional precursor to Lisbeth Salander of The Girl With the Dragon Tattoo. In terms of personality, there are strong parallels -- both women are brilliant, tech-minded, and emotionally closed off due to past extreme trauma. A third parallel could be Vanessa Michael Munroe, the outwardly androgenous investigator provided by series author Taylor Stevens. All three women ignore social rules when they need to, all three can hack a hard drive overnight, and all three commit criminal acts in the process of bringing justice to criminal situations. And it would be easy to slap a label like sociopaths onto them, because of the violence they seem to not regret. Yet a recent letter to readers from Taylor Stevens firmly made the cogent point that her protagonist -- and, I think, the others I've just mentioned -- lives far differently from the lack of empathy that a psychopath (and perhaps sociopath, depending on whether you see them as similar) displays. In short, Munroe gets done what needs to be done, and since nobody else can keep up with her, she does it in the best way she can -- while accruing a cost, enlarging her own preexisting wound. That's certainly the case for Lisbeth Salander. 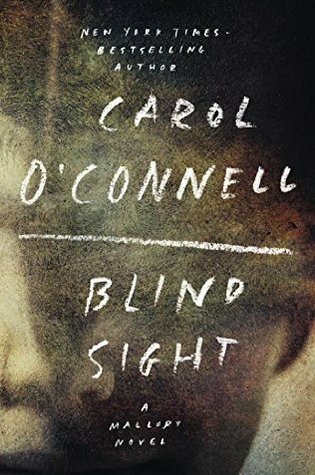 But the biggest surprise twist of BLIND SIGHT from O'Connell is the possibility that Mallory's network and her own choices may lead her in a new direction: away from further pain, and perhaps toward some sort of inner justice and balance at last. And that's part of why every Mallory novel is worth reading -- for the empathy that works its jagged way through O'Connell's edgy narrative style, and the sense that something in the world might end up less wrong and more right than before. The release date for LEVEL GRIND is October 4, but collectors may want to spring into action now, because this suspenseful page-turner -- yes, it's fantasy, but it reads like a good thriller! -- has a very unusual background. Author Annie Bellet is already a USA Today bestselling author. Fans know her through her e-books, especially the seven of them that make up the "Twenty-Sided Sorceress" series. And in a marvelous action from Simon & Schuster via its Saga Press imprint, the first four "books" of the seven are packed into the book LEVEL GRIND. This is a paranormal series, set -- of all places! -- in snowy Idaho. Magic-endowed protagonist Jade Crow has Native American background, difficult-to-reach family members from whom she is estranged, gamer/nerd friends like herself (she's a "new adult" who owns a gaming shop), and a terrible enemy: the most powerful sorcerer alive, who happens to be her ex-boyfriend. Jade's loyalty to her friends, struggles to gain her own Dungeons & Dragons-related skills, and pressing peril combine to make this a highly memorable series. 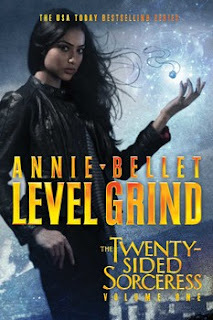 I won't say exactly what steps I took after devouring an advance copy of LEVEL GRIND ... except to say that the reading was so good, I didn't stop there! If you enjoy paranormal twists, check out Bellet's website and catch up with the excitement around these books. You'll see them marketed as "young adult" (YA), and they're certainly good for that age group, but maybe even better for those of us who'll understand the classic lines quoted from Star Trek and the many gaming references tossed in. (Got mine from listening as my sons grew up.) All fun, and one of the most enjoyable non-mysteries to cross my review desk this year! Collecting international mysteries? I am. And there's always another author to catch up with. 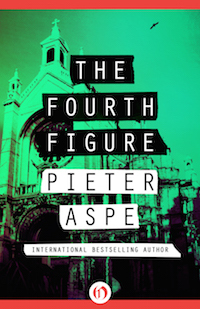 This time, I am really happy to discover Pieter Aspe, who writes in Flemish and has a wide European readership. Thanks to Open Road Media and translator Brian Doyle, the series is arriving in America, and THE FOURTH FIGURE has a September 13 publication date. Commissioner Pieter Van In has a small but expert crime-investigation team in Bruges, and can count on his sergeant, Guido Versavel, to back him up. That's especially important right now because Van In's emotions are all over the place -- his beloved Hannelore is mere weeks away from having their baby and he'll be a father, a complication he hasn't yet adjusted to. For Van In, that means his drinking is escalating. He's still the best at his job. But when his boss adds a stunningly beautiful and seductive journalist to the investigation of a suicide-with-doubts and a network of Satanic gatherings, Van In's stability crumbles. Religious fanatics and ordinary criminals maintained different sets of norms, and that made it all the more difficult to track them down. "That's strange." Guido was opening the remaining drawers in the desk. "Somebody's been clearning up." The drawers were completely empty. Van In shook his head. The entire affair was beginning to stink. "Maybe we should put things on hold for a bit," he said guardedly, "wait until we know the precise cause of death." "You're afraid we might stir up some hornet's nest." "I'm praying we haven't already, Guido." "Prayer sound appropriate, given the circumstances," Guido said with a smile. Menace, risk, and terrorism rapidly accumulate, and Van In's home situation trembles on the edge of disaster. Aspe's skills ramp the tension rapidly upward, with characters that linger afterward, until reading the rest of this well-established series is suddenly a "must." Open Road Inegrated Media has four available now; more than 30 others look possible. Good discovery! Here's a debut thriller that's clearly positioned in the Dan Brown subgenre: The abrupt death (by lightning strike) of an investigating professor leads to mysterious documents reaching journalist Jake Wolsey -- papers that point to a missing and highly significant ancient Etruscan manuscript. Jake soon discovers that his inquiry into the professor's death and the documents has made him a lightning attractor for the British Secret Intelligence Service. Partnering with a knowledgeable (and attractive) archaeologist, Florence Chung, Jake begins a risky race toward information that at the very least was valued by Winston Churchill ... and may affect the rise and fall of civilizations. 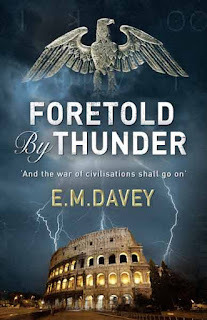 FORETOLD BY THUNDER is a fast-paced thriller, and fans of the subgenre will appreciate the detailed sense of history that E. M. Davey brings into the unfolding situations. Don't expect to bond deeply with the protagonist, though -- Davey's more interested in spinning a global and inclusive conspiracy theory, and less in the depth and motivations that spur Jake onward with his life at stake. It always made Jenny Frobisher smile to see Hollywood's depiction of a Secret Service incident room. There would be banks of glowing monitors, agents roaming around some 3D-rendered desert, satellites being repositioned at a moment's notice. The reality was somewhat different, Jenny thought, as she looked about her base of operations. Four computers, four telephones, whiteboard, kettle. The only impressive thing was the view of the Thames. She could make out a guide pointing up at them from the deck of a tourist ferry as he honed his James Bond spiel. This was the prophecy of the turning of the wheel. And the war of civilizations would go on. Jake awoke, gasping for breath. For the second time he was disorientated. Was he still asleep? A dream within a dream? He sat up to find himself on a sofa in a pay-by-the-hour hotel room. ... the despair of its climax was all-pervasive. Something Florence had said about Etruscan faith came back to him. A dark religion. Before the Gods man was a complete nonentity, his fate entirely in their hands. Jake shook his head again ... his phone began to ring. 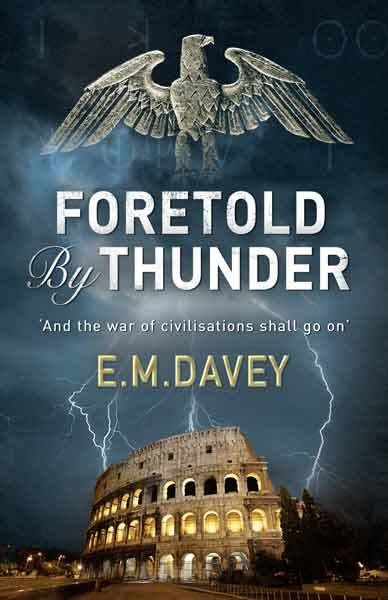 Pick this one up for light reading and an intriguing conspiracy theory that stretches across millennia. And let's keep an eye out for how this debut author develops his series, via The Overlook Press. With this 11th in the Billy Boyle World War II mystery series, author James R. Benn crafts a tight and un-put-downable suspense novel and proves that the past is crammed with surprises -- and danger. Fans of the series know that Billy Boyle's Irish-American cop family thought they were getting him out of wartime danger by helping him get assigned as a crimesolver for a slightly related U.S. officer, Dwight Eisenhower -- but when "Uncle Ike" took over running the European part of American operations in World War II, Boyle's investigations moved global. Wherever Eisenhower and his top leaders need Boyle to solve a crime, he's there. As BLUE MADONNA opens, Billy Boyle looks like he's lost his stripes as punishment for taking part in running a black-market scam. Even though he knows his actions were part of successfully solving a crime earlier in the war, Boyle realizes he can't fight the court martial system; he's headed for prison and humiliation. So it's a great relief to discover the whole trial is a setup to infiltrate Billy into a massive criminal operation that's snagging shipments of necessary supplies from the Army and speeding them out into England's hungry black market. With eventual backup from his colleague Kaz, and the possibility of seeing his beloved Diana in her undercover role in occupied France, Billy leaps into the infiltration operation -- which lands him in France on June 5, 1944, the night before the Allies invade at Normandy. And that's the pin that James Benn provides to move us one notch further along in the global war that engaged so many combatants for so many years. Checking a "World War II timeline," I realized Anne Frank and her family were still hidden when Billy Boyle dropped from an airplane, to tackle this mission behind enemy lines. Cold sweat dripped down the small of my back. Slowly sounds from the woods overcame the silence. A rustling of leaves. A scurry in the underbrush, a small creature on the prowl. A boom echoed in the distance. An explosion miles away. We duck-walked to Kaz, who held a finger to his lips as his gaze flitted about. . . "I thought I heard voices," he whispered. "What do you think that explosion was?" "Of course," I said, trying not to betray my nervousness. It was eerie being out here, alone on a hilltop in enemy territory, not knowing who might be closing in or what was going to happen next. Billy must pass himself off as crooked -- which is what the fake court martial should have established -- and figure out who in France is connected with the biggest criminal gang in England, and how. Meanwhile, his surroundings include a multiple murderer (if he can just figure out which of the dangerous men around him that might be), as well as the Germans, whose motives are both war-related and criminal, and not easy to sort out. This is a fast-paced tale of action and risk, and Billy Boyle works hard to gain enough facts to get close to resolving his investigation. Just as we know World War II goes on beyond BLUE MADONNA, we know Billy must survive also ... but who could he lose from his close friends and loved ones long the way? I especially enjoyed learning from the author's notes of all the "real" components woven into this exciting crime-and-war novel. It's getting harder with each book of the series to remember that Billy Boyle is a fictional sleuth. 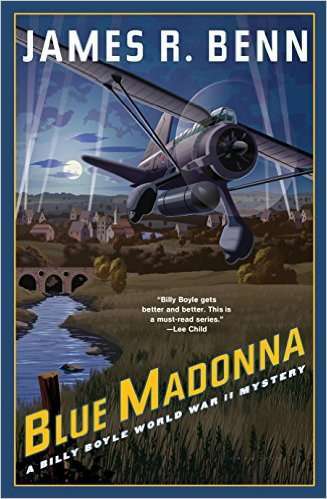 Of course you can read BLUE MADONNA without having read any of the earlier titles -- Benn's skill as a series author makes that easy -- but series fans will shiver with even more feeling as Diana and Billy and their team plunge once more into necessary dangers. From Soho Press, with release on September 13. When you've read BLUE MADONNA, you may have a list of people you want to share this with, and they absolutely don't need to read the "usual" war fiction -- this series is rich with friendship, puzzle-solving, and adventure, and lots of intriguing twists. I'm adding it to my holiday giving list, for sure. 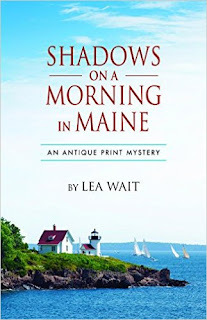 The latest in the "Antique Print" mysteries from Maine author Lea Wait makes its appearance on September 9, and it's a great way to welcome the new season! Maggie Summer, a dealer in antique prints, has just made the big changes she's struggled toward over the course of the earlier books -- taking a sabbatical from teaching in New Jersey, moving to Maine, being engaged to Will Brewer, and approved to finally adopt a daughter (as a single mom). But as the title SHADOWS ON A MORNING IN MAINE hints, none of this will come easily -- and there's risk and danger ahead. Wait writes at her strongest and best in this engrossing page-turner, threatening Maggie's dreamed-of life (and even her safety) with three forceful currents of suspense: Now that an adoption requires the child's consent, the social workers' positive opinion, plus the parent's fitness for the challenge, will Maggie be able to persuade the wounded and defensive nine-year-old Brook that this single-parent-with strings household is where Brook can be happy in a "forever" home? Second, now that her first priority is (she hopes) her new daughter, can Maggie still be the partner that Will needs and wants (and what's up with the secret from his past that he finally reveals)? And third -- most vital for Wait's skillful answer to the burning question of this genre, why would Maggie risk her life sleuthing -- if someone in the area is deliberately killing seals, the animals that represent "home" to young Brook, can Maggie stop the destruction before her almost-daughter hears about it and refuses Maggie's affection? By adopting a nine-year-old, a child adoption agencies classified as "older," she's missed the fun of decorating a nursery or toddler's room. But Brook still had plenty of growing up to do. Maggie stared at the seal prints she'd liked so much. She'd wait to show them to Brook until she was sure Waymouth's seal killer had been caught. Brook didn't need to be reminded of what she'd seen at the high-tide mark. Of course, there's also the problem of this vulnerable girl discovering that Maggie herself has been an amateur sleuth around other deaths in the community. Never has the investigation habit looked like such a risky one! As Wait ties together all the issues confronting Maggie and her growing "family of choice" (including Will's Aunt Nettie), she also shows the choices that lead to both solving the crime and working out the dilemmas of love and community -- with quintessential Maine flavor. There's plenty of traditional "mystery" involved to keep the pages flying, and, most of all, there's a whole family work of commitment and affection to pull together. Readers of earlier books in this series (this is number 8) will especially appreciate Maggie's efforts and achievements -- but you can jump right into this one and enjoy an exciting adventure, and then catch up on some of the others when you have time. There's also the allure of peeking into Wait's own life a little -- explore her website and discover her deep and extensive personal connection to adopting a daughter who needs a committed mom. From Perseverance Press, with a classic Maine cover as well. Happy reading! 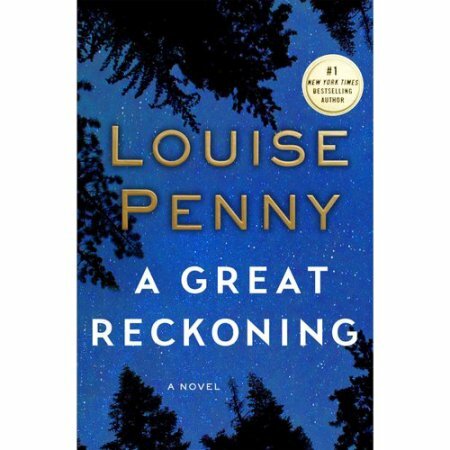 Although the pre-launch event for Louise Penny's newest book took place, as usual, in her home area of the Eastern Townships of Quebec, Canada, the brief book tour for A GREAT RECKONING began officially last week in Naperville, Illinois, followed by Wichita, Kansas; Kansas City, Missouri; and St. Louis, Missouri. And although stops in the Carolinas and Washington, DC, will wrap up the events, this "heartland" opening confirms what has taken place over the arc of Penny's dozen titles featuring Chief Inspector Armand Gamache, of the Sureté: Both the author and the books have become global in appeal, and the voracious readers of America embrace both the Chief Inspector and the enchanting village of Three Pines that draw him into its warm welcome. As A GREAT RECKONING opens, Gamache officially concludes his brief retirement (he's not yet 60) and completes selecting the young protegées for the next stage of his career: In an effort to root out the evil that's permeated the Sureté through both the monsters Gamache has already expelled from it, and the oddly twisted and malicious new recruits entering the police force, Gamache is taking over the Sureté Academy itself. And so resolves the quandary that the immediately preceding books had asked: What would this wise, strong, and above all kind leader choose for his next act? But of course, nothing is simple. And the dossier of the last student Gamache finally OK'd, Amelia Choquet, makes up one part of the mystery here -- for we know, as readers, that although Amelia herself is unaware of it, Gamache has found an imperative connection with her: pierced, tattooed, irreverent, and angry young woman though she is. The author will force us to wait a very long time until we know what that connection is. But in the meantime, Amelia and three other cadets are forged into the task force that Gamache needs, to approach two other mysteries: the existence of map that shows the village of Three Pines (you need to immerse in the book to grasp why that's so strange; readers of previous volumes already can guess), and a violent murder in the Academy. Gamache had survived, of course. And Isabelle had not had to deliver the final message. "And I won't run away now," he said. "We stay the course." "We've seen worse, haven't we, Isabelle?" he said. She smiled. "We have. At least the cadets aren't armed and shooting at us. Yet." Gamache gave a single gruff laugh. "I've asked the chief of police to quietly take all the ammunition from the armory. The weapons will stay, but there'll be nothing to fire." Her smile disappeared. "I was joking. But you're seriously expecting trouble on that scale?" "I was not expecting a murder," he said. His face as serious as she'd ever seen. "The cadets must be safe." Penny's efforts in A GREAT RECKONING (the title comes from a Shakespeare line, with connections to a long-ago murder) diverge from much modern crime fiction: She depicts evil, and names it as such, without using a brush dipped in blood or gore. Instead, she shows how the loss of innocence and trust, especially when inflicted by malicious elders on eager youth, is a form of evil that good people must take arms against. Gamache's own weapons are his experience and wisdom, his loving sense of responsibility, and his insistence on kindness -- in itself an amazing choice of weapon, as even he must admit. So there will be no need to check the lock on the door, turn on more lights, call a friend in order to disengage from the suspense. Instead, the pages must turn in order to learn whether Gamache can use this fierce sort of love as a demand that evil yield up its violence and seek forgiveness. And when all three strands of mystery in A GREAT RECKONING finally resolve, we readers have faced some new aspects of courage.